Push your outdoor training to the extreme with these three high-intensity, total-body workouts from Mike "Thor" Kundla. This is what training outdoors should feel like! When sunshine and warmer temperatures beckon, it's hard to stay cooped up in the gym. So why try? 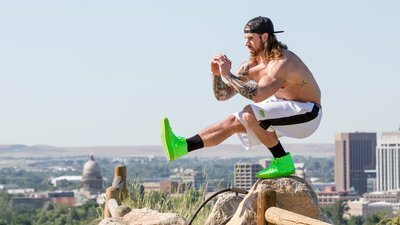 When his session with the iron is done, MusclePharm athlete and two-time NPC Natural Ohio Physique overall champ Mike "Thor" Kundla brings his workouts outdoors whenever possible. A fan of extreme sports as well as extreme lifting, Kundla enjoys the intense challenge of high-intensity interval training (HIIT). In these routines, you work seriously hard for short periods, then rest briefly, recharge, and do it again. "I want to get the most efficient and most beneficial cardio I can in the shortest amount of time, which is one of the reasons why I'm a huge fan of HIIT Training," explains Kundla. "I'm sure as hell no cardio queen. You will rarely ever find me on a treadmill or doing any other type of steady-state cardio." Where you will find him is out in the sun, enjoying intense workouts that boost metabolism and maintain his power and size. We asked Kundla to share his favorite outdoor HIIT workouts, all of which are designed to provide an intense workout with little to no equipment. "I chose these exercises because they're a great combination that you can knock out pretty much anywhere you go," he says. In this first workout, Kundla combines jumping rope with toes-to-bar, box jumps, and sprints. As he explains in "The Full-Body Workout To Boost The Big Three Lifts," box jumps are a big payoff move that also happen to be "a very effective way to develop squatting and pulling strength in any athletic program." The lack of a plyo box is no deterrent to Kundla—he is just as comfortable bounding onto nearby boulders. If you are not yet accustomed to leaping over tall buildings, find a sturdy bench or low wall on which to perform this exercise. For the toes-to-bar, make sure you retract your shoulders while hanging. This will help engage your lats while you work your core—and plenty of other muscles with it. Increase Endurance and Hydration to Rebuild Muscle! Those who've suffered through two-a-day sports training in sweltering summer heat know one of the most effective conditioning protocols for elite athletes are stair intervals. But unlike the dreary minutes spent on an indoor climber, the shorter, more intense bursts of HIIT make outdoor stair intervals bearable and even fun (in a cruel way). "In my opinion," says Kundla, "HIIT training like this is something that people are more likely to actually stay committed to. Long, steady-state cardio can be such a monotonous bummer!" For your second outdoor workout, Kundla combines dreaded stair intervals with bodyweight pistol squats and push-ups, rounding out the total-body cardio with total-body strength. You can always substitute a hill or treadmill for the stairs—but you know you'd miss the sick quad burn that comes from bounding up those stairs! If you've already gone HIIT-level beast-mode, you're probably familiar with the "afterburn effect" of higher intensity workouts. Also known as post-exercise oxygen consumption, this phenomenon means, in Kundla's words, that "your body uses additional calories to repair muscles and restore oxygen levels after your workout is over." The upshot: You burn calories hours after you finish your training, depending on how intensely you trained. The greater the intensity of your workout, the greater and longer-lasting the effect. If that doesn't inspire you to pull out all the stops for your cardio, Kundla's got a final HIIT workout to really challenge your limits. Incorporating jump-rope intervals, bodyweight resistance, and sprints, this final workout is Kundla's throw down to "all my one rounders out there." Simple? Yes. Easy? Try it and find out! To build size, speed, and conditioning like Thor, plug one of these outdoor workouts into your programming about 2-3 times per week.